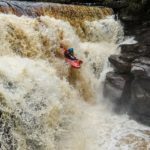 Eken H9 - a good cheap action camera | DBP MAGAZINE ONLINE The World's Best Free Whitewater Publication. We all love action cameras – they allow us to show our friends our epic line (or epic beater) on the river. However, gopro’s etc are very expensive. If you lose or damage one on the river, it really hurts. In my opinion, they are worth it for how good their image quality is, but there are times when you just don’t want to risk it. These days, there are a lot of cheap alternatives out there. However, a lot of them promise the world but deliver nothing. They use methods to advertise they can do things like record in 4k that destroy the quality of your recordings. Most cheap action cameras are garbage. We’ve had a good sift through the garbage though, and think we’ve found a hidden gem: the Eken H9. It doesn’t promise the world, but what it does do it does well considering its crazy cheap price. The only big issue is that it cannot really do 4k, but very few people need that capability. Read on for a full review, or you can pick up a camera for $60 from our store. Buying it through us allows us to run more awesome things like the recent video competition, and helps with the upkeep of the site and for purchasing merch for you guys like stickers etc. So why is the Eken H9 is an interesting camera? Is it because it shoots videos in full HD at 30 or 60 fps? Is it because it comes action-packed with accessories,has a built in WiFi and a neat 2 inch LCD screen? Or is it maybe due to the fact that it can shoot 4K videos in useless 10 fps? The camera uses the same OV4689 image sensor as three times more expensive SJ4000+ and M10+ cameras, but has a different, unknown Sunplus 6630 processing chip. H9 can shoot videos in these resolutions, fps and bit rates. The 4k/2.7k options on this camera are effectively useless – 10fps and 15fps video cannot be used for anything useful. Resolutions you will probably use the are 1920 x 1080 (FULL HD) at 60 or 30 fps. If you intend to use slow motion in your video, shoot at 60 fps, as more frame rates give impression of more realistic and faster movement. 60 frames per second can be slowed down in post production and still look smooth, so if you know how to use video editing software, 60 FPS is a way to go. For some every day recording, use 30 FPS, as it consumes less memory and battery. Colors that the image sensor produces are okay for the price, but in some cases it appeared to me that that images looked over-saturated over-sharpened. Colors depend a lot on the light condition and position of the camera. Still, images are decently sharp for 4 megapixels senor and camera focus seems to be set up quite well, so even in distance objects are visible.